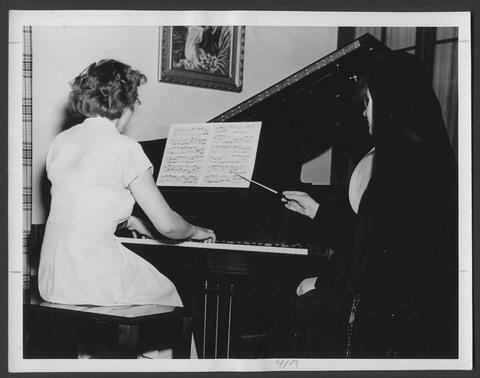 The Sisters of St. Joseph have a long history of music instruction. The St. Joseph’s School of Music traces its beginnings back a century ago to 1914, when the Sisters of St. Joseph first took up residence at Sacred Heart Convent in London, Ontario, and began formal music instruction, due to the initiative taken by Sister Ursula McGuire and Sister Patricia Mallon. The school's earliest known music recital took place in 1919; however, it wasn't until the early 1920s that the school was established as the Sacred Heart School of Music. The music ministry has an even longer history, though, as individual Sisters were actually offering music lessons in small mission houses and schools throughout Ontario as early as 1867. In the early days of the Sisters’ music ministry and the Sacred Heart School of Music, music studios were established in a number of schools within the London Separate School Board, and Sisters would visit the schools once or twice a week to teach. These schools included St. Michael, St. Martin, Holy Cross, Holy Rosary, Blessed Sacrament and St. Peter’s Catholic Schools. By 1929, the music ministry had 27 music teachers, and the Sisters offered music instruction in Windsor, Belle River, Leamington, Goderich, St. Mary’s, Ingersoll, Woodstock and St. Thomas in Ontario, as well as in Edmonton, Alberta. That year, Sister Callistus Arnsby was appointed Community Music Supervisor and Principal of the Sacred Heart School of Music. She was responsible for creating uniformity in policies and structure throughout the schools, and for helping the Sisters to grow professionally. The Sacred Heart School of Music’s instructors studied and were trained themselves at the London Conservatory of Music (1892-1922), which later became the Western Ontario Conservatory of Music (1934-1997). Some of the Sisters also received special instruction in violin and piano teaching from a well-known musician of the time, Mr. St. John Hyttenruck. The Sisters originally taught a program of studies based on the examination requirements of the Toronto Conservatory of Music (now the Royal Conservatory of Music). Students could take annual examinations, with examiners from the conservatory coming to the school for the exams. However, when the Western Ontario Conservatory of Music was established in London in 1934, the Sacred Heart School of Music began following its courses and requirements instead. As the years went on, the Sacred Heart School of Music continued to grow. School policies were instituted, student recitals took place regularly, scholarships and awards were established, and bi-annual report cards were issued to students. There was even a music library. In the 1940s, the Sacred Heart Concert Orchestra was formed by Sister Immaculata Brophy. Originally a string ensemble, the orchestra eventually expanded to include wind, bass and percussion instruments. The Sacred Heart Concert Orchestra played frequently at important civic and religious events, and gave annual concerts in London and other nearby cities until the late 1940s when it disbanded. When the new Mount St. Joseph Motherhouse opened in 1954, the music school was relocated there and its name was changed to the St. Joseph School of Music. The new St. Joseph School of Music contained larger, modern facilities, including St. Cecilia’s Recital Hall and adjoining music studios for teaching and practice. However, some of the school’s original studios were still retained, such as the studio at 429 Colborne St., a small house across the street from the Sacred Heart Convent, which continued to be used for teaching until 1973. In addition to piano and violin instruction, the Sisters also offered vocal instruction. In fact, Sister Mary Margaret Childs organized several choirs over the years, including a senior girls’ choir called the School of Christ Choristers and a junior choir called the Little Radio Choir. In 1963, she formed a choir of her own senior vocal students called the St. Cecilia Singers who sang a repertoire of sacred songs, folk songs, popular songs, plain chant and carols. The St. Cecilia Singers made quite a name for themselves, touring throughout Canada and the United States and winning many awards at Rotary and Kiwanis Music Festivals. The choir is still in existence today as part of the Don Wright Faculty of Music at Western University. By 1972, the St. Joseph’s School of Music had an enrolment of approximately 400 students, and lessons were offered in piano, violin, singing and music theory. At this point the school had 30 teachers, seven of whom were Sisters. In September 1982, the St. Joseph's School of Music was amalgamated with the Western Ontario Conservatory of Music on the University of Western Ontario campus. The St. Joseph's School of Music programs continued, its teachers were invited to join the conservatory staff, and its students were able to continue with their same teachers. By 1993, only three Sisters remained teaching at the conservatory. Shortly thereafter, the three Sisters began teaching independently again, offering independent instruction at the Mount St. Joseph Motherhouse. Today, in 2014, Sister Caroline Bering is the sole Sister still offering music instruction, with one student under her tuition. The records were transferred from the St. Joseph's School of Music to the Congregation of the Sisters of St. Joseph in Canada - London site archives. Some records in S003 have restricted access. There are series and file lists available. This sous-fonds is considered closed.